Oh, cinnamon rolls, banana bread. How have I not joined you before? Let me set right this injustice, join your little hands, if you will, so you can forevermore be united in holy sweet baked good matrimony. Dramatic? Over the top? I think not (Rhonda). After having such success with my 7 Ingredient World’s Easiest Vegan Cinnamon Rolls, I knew more experimenting was to be done. You guys have been loving on my first recipe. It’s been one of our most popular to date! And because I love banana bread so much, this recipe was bound to happen sooner or later. The banana bread infusion happens in two ways: 1) banana puree in the dough, and 2) banana slices and walnuts in the centers. The result is an amazingly moist, banana-bread like cinnamon roll just begging to be frosted (and that, we must do). BONUS: This recipe is seriously simple! Just 1 bowl and 9 ingredients (10, including the glaze). Plus, there’s only one true rise and no fancy methods required. 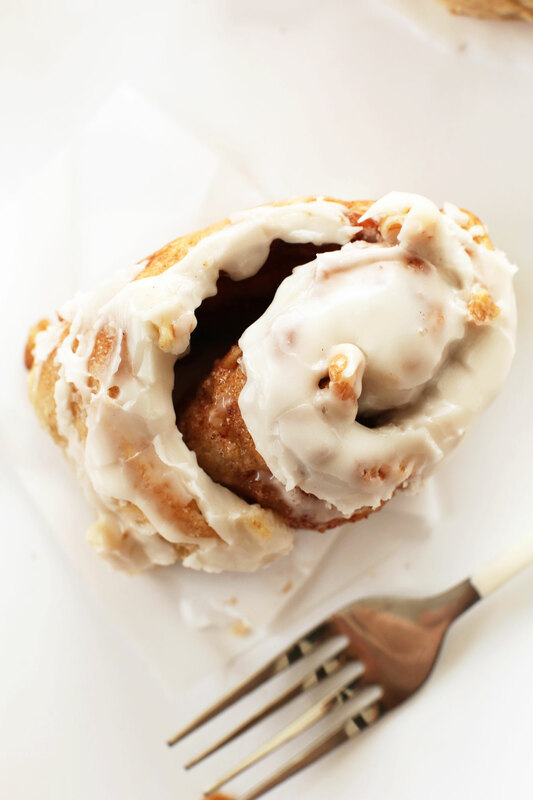 Just pure, easy, simple cinnamon roll goodness that takes about 2 hours total. This means you could wake up around 9, make these little gems, and be enjoying them by brunch. Huzzah! Make these rolls for a special weekend breakfast or brunch, or on a Sunday to enjoy throughout the week (that’s a good week). And if you take these rolls to work, I can almost guarantee you’ll be the queen (or king) of the office. That’s right, so many friend requests, so little time. If you do try this recipe, let us know! Leave a comment or take a picture and tag it #minimalistbaker on Instagram! We absolutely love seeing what you guys cook up. Cheers and happy baking! 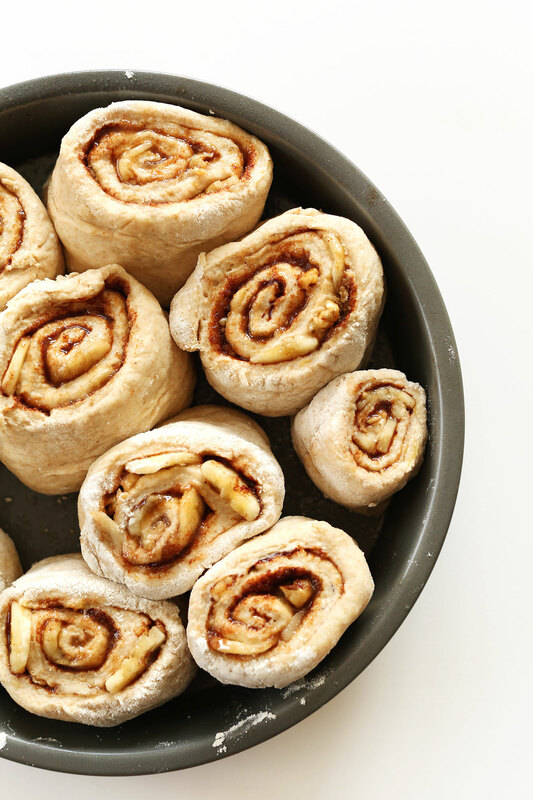 Simple, fluffy vegan cinnamon rolls infused with banana bread flavor and made in just 1 bowl! Sprinkle on yeast and let activate for 10 minutes. Then add sugar and salt and stir. Next, add in mashed ripe banana and stir. Add flour 1/2 cup at a time, stirring as you go. The dough will be sticky. 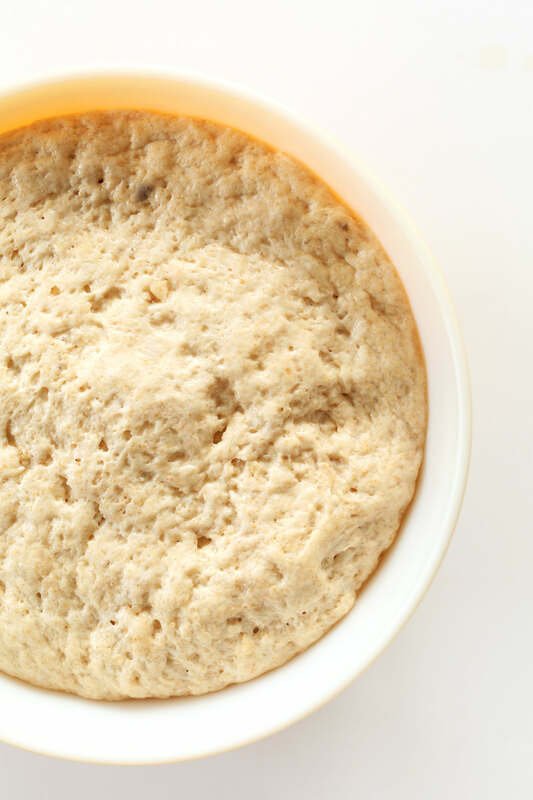 When it is too thick to stir, transfer to a lightly floured surface and knead for a minute or so, adding flour as needed, until it forms a loose but still springy ball. Only use as much flour as it will take. Rinse out your mixing bowl, coat it with avocado or olive oil, and add your dough ball back in seam side down. Cover with plastic wrap and set in a warm place to rise for about 1 hour, or until doubled in size (see photo) - mine only took 40 minutes. FILLING: On a lightly floured surface, roll out the dough into a long rectangle ~1/4 inch thick. Brush with melted vegan butter and top with cane sugar (I used a little brown sugar mixed in with the cane sugar) and 1/2 - 1 Tbsp cinnamon (up to preference // amount as original recipe is written // adjust if altering batch size). Then add banana slices so it's easy to roll, and walnuts. Slowly and tightly roll up the dough and situate seam side down. With a serrated knife or a string of floss, cut the dough into 1 1/2 - 2 inch sections and position in a well-buttered 8x8 square or comparable sized round pan (you should have about 10 rolls as original recipe is written). TOPPING: Brush with melted vegan butter and sprinkle with sugar (brown or cane) and remaining walnuts. Cover with plastic wrap and set on top of the oven to let rise again while you preheat oven to 350 degrees F (176 C). Once the oven is hot, bake rolls for 28-35 minutes or until slightly golden brown. Let cool for a few minutes, then serve warm. Optional: Frost with dairy-free cream cheese frosting or a simple dairy-free glaze (recipe below). Cinnamon rolls should keep covered at room temp for up to a few days, though best when fresh. You can freeze at the stage where the dough is cut into cinnamon rolls and placed in a pan. Cover well and freeze in a pan, then let thaw for at least 6 hours before baking. Cover and set on top of the oven while preheating to help rise. Bake as instructed. *For a simple dairy-free glaze, melt (as recipe is written // adjust if altering batch size) 1 Tbsp vegan butter and add to ~2 - 2 1/2 cups powdered sugar. Mix and gradually thin with dairy-free milk 1 tsp at a time until pourable but still thick. *Adapted from my World's Easiest Cinnamon Rolls. ← Announcing: Food Photography School! Really easy! I made these (in addition to other treats) to promote fairtrade with fairtrade bananas from work. They went down a treat at the bake sale, really wish I made more. I made it with non-vegan products due to having to use products in store and we don’t sell vegan cream cheese. It still worked perfectly fine with dairy products and was delicious. Thank you! Just made the banana cinnamon rolls and they are absolutely fabulous! I just had one and I really want another immediately. Can’t wait for my husbaand to try them. Thanks for another great recipe! I made them for my co workers ..omg 🤤 smells so good ! We loved these! I made them just as the recipe told me to with the vegan cream cheese frosting. I was shocked at how delicious they were. We used 1/2 whole wheat flour and 1/2 white flour. We also used the organic cane sugar- the slightly thicker granules make a slightly crunchy sugary topping. Yum! Great recipe- and thank you! Hi! I have family members allergic to all types of nuts, but would LOVE to serve your recipe for the holiday season coming up. How can I replace almond (flour, milk, nut ANYTHING) with something more vegan & allergy-free friendly? Hi Cristina! For this recipe, feel free to swap the almond milk for another non-dairy milk. Hi Dana! What about the flour? I notice in many of your recipes you use nut-flour? What can i replace for this? Hi Christina! We use nut flours to keep the recipe gluten-free, but if you aren’t GF then you may be interested in this recipe. Hi! Do you think it would be possible to leave them to do the final rise in the fridge overnight so they can be baked fresh in the morning? Yes! Just refrigerate overnight, set on the oven while preheating the next day, and bake as instructed. These were hands-down the best cinnamon rolls I ever made. Really easy and so good! I subbed rice milk for almond milk, because that’s what I had in the house and added just a little vanilla to the powdered sugar icing because vanilla is awesome. This banana in the dough makes it extra sticky, so keeping the kneading area well-floured is essential. I was worried about the amount of butter used in the filling – seemed like more than was needed, but trusted the recipe and everything worked out beautifully. Thanks so much for this recipe. We will definitely make this again! This was really good! I added more warm spices (pumpkin pie spice, extra cinnamon, nutmeg and ginger) to the filling and used the cream cheese frosting from the GLUTEN-FREE ZUCCHINI CAKE (I halved that recipe). Thanks for another amazing recipe, Dana! I’m not sure what exactly where I went wrong on this recipe! Tried it this morning. Slowly added flour until I had what I thought was a springy ball but then after 1.5 hours it hadn’t risen that much, but was bigger than when I started. Maybe my yeast never activated, problem 1. Then when I was trying to roll out the dough it kept sticking and crumbling… Too much flour? I decided to move ahead even though it wasn’t looking good at this point. They turned out OK. Not sure if I would invest the time/energy again. Hi Lydia! Sorry to hear you had some difficulties with this recipe. It sounds like your yeast was possibly too old? As for the crumbly dough, adding moisture will help the dough become more coherent. Add a few sprinkles of cold water (no more than a teaspoon at a time), handling the dough as little as possible until it’s evenly moistened. Made this yesterday to bring over to my friends’ new house and they absolutely loved them! I don’t think I quite got the flour ratio right, but they still came out delicious, the bananas really added a bunch of flavor. We are glad you all enjoyed these, Joshua! Hi, I have a yeast intolerance is there anyway of making them with something else? Not that we know of at this time, Lorna! Sososososo good! I’ve made this twice, once for thanksgiving and everyone raved and a pregnant relative begged for the recipe. I will add that I used regular milk and butter though. Amazing! Do you have a Gluten Free version of this? I would love to make it! Hi Theresa! We wish we could comment, but we haven’t experimented with a GF cinnamon roll yet. But if you try it, please report back! THESE ARE AMAZING!!! 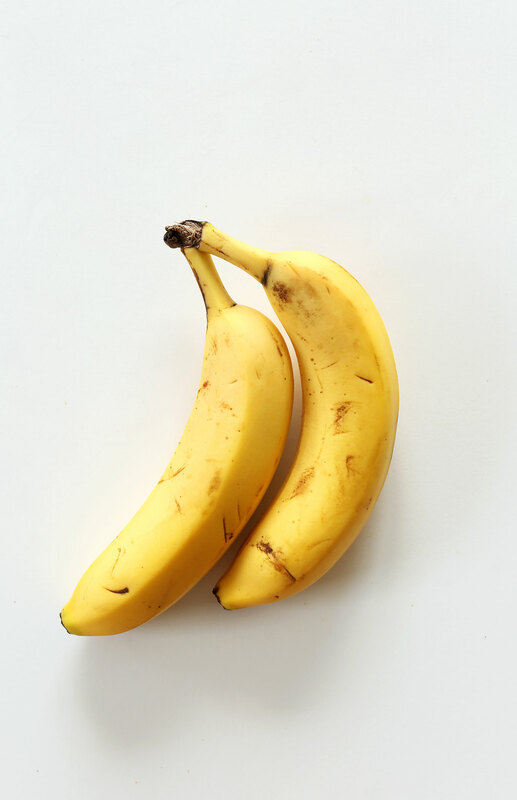 I had some overripe bananas to use and was looking for ideas online on how to use them when I came across this recipe. Instead of yeast and flour I adapted it with self raising gluten free flour, and they still turned out SO DELICIOUS!! Btw, your page is a freaking haven for celiacs and I don’t want to ruin anything by moving too fast but I love you. Also, just wanted to let you know that this recipe was just SO GOOD that I ended up translating it to Norwegian and shared it with family members and on a Celiac forum, linking to your page of course. These look amazing! Unfortunately, where I live, vegan butter is not accessible… is there any way to alter the recipe, and sub the butter with something else? Coconut oil, for example? Thanks! Hi Georgia! It will affect the flavor, but I think so, yes. I had never made cinnamon rolls before but was craving them and had bananas that were turning ripe and the I found this recipe! I made them gluten free, which is just a matter of different flour. Anyway this recipe was easy to follow and I really like the walnuts! I’m not sure what I did wrong but they were a bit flavorless, I’ll keep experimenting and I’m sure I’ll get it right soon enough! Do you think it’s possible to replace the butter in the cinnamon buns with coconut oil? I don’t have access to earth balance or another vegan butter. Also, do you happen to have a glaze or icing that doesn’t require vegan butter? Or perhaps I could sub in coconut oil for that too? Hi Alison! It will affect the flavor, but I think so, yes. This recipe is another one I have made multiple times and everyone who’s had a piece or two, or three loves it. So thanks for deliciousness. Hi Dana, is possible to use coconut butter instead of vegan butter? Thanks! Just made these, and GOOD LAWD these are heaven. Seriously so dang good. I am just knocking these recipes out of the park!! EVERYTHING I have made from your website and cookbook has been amazing. I have to say it’s easy living a vegan lifestyle when you have amazing food recipes from Dana! Thinking about making these for a trip with friends, however Id have to make them the day before and heat them up before serving (adding the frosting after of course). Will this work? Has anyone tried this? I’m thinking a low what to just warm ’em up. Thanks! Yes that’ll work! Just let them cool completely before storing and store in an airtight container and they’ll stay fresh for serving! I just finished making these and oh my goodness. First of all, I’ve never made cinnamon rolls before, I wouldn’t consider myself any sort of Baker. But this recipe was so easy (almost foolproof) and these cinnamon rolls are among the best ones I’ve ever had. I just wanted to say thank you for all of your recipes. I went vegan about a year ago, using your website and your cookbook have helped me so much! I know I can always count on your recipes to impress not only myself but my non-vegan friends/family. These barely fit into the suggested 8×8 sized pan, and barely cooked in the middle. They were good, but would be much better as 12 rolls in a proper 9×13 pan. No gluten free option over this marvelous cinnamon roll? Have you tried filling it with peanut butter??? No we haven’t If you do, let us know how it goes! Would it work out all right if I used Almond flour instead of all-purpose flour? Hi Jean! We haven’t tried it yet! If you do, report back on how it goes! Holy moly roly poly. These were phenomenal. Made a glaze of powdered sugar, some soy milk, vanilla, coconut oil, and cinnamon for the top. Divine. Thank you for your expert instructions. I made sushi for the first time last night from your recipe. I absolutely love Minimalist Baker and recommend all the time. Thank you thank you!! I made these yesterday for my boyfriend’s birthday breakfast. I’ve never made cinnamon rolls before and this recipe was easy to follow. They turned out absolutely amazing. I felt like I was eating a Cinnabon, only vegan and with bananas. So it was 100x better. Can I use regular butter instead of vegan? I recommend doing more than one banana sliced in the middle. They were good bits of caramelized goodness, but I think it would be better with 1 1/2 – 2 bananas sliced. Also, definitely do the brown sugar and not just white! These are soooooo good! They’re almost too rich, but not quite. I rolled them up the wrong way but they still turned out great. I think I’ll probably halve the recipe next time, though, since there’s too many for 2 of us and I’ll have to figure out what to do with the rest. I don’t really like vegan cream cheese, so I just used your sticky bun topping instead. Oh, I forgot to ask – how do you measure your flour? I know some people scoop the flour with the measuring cup, some people spoon into the measuring cup and level, and it’s hard to tell who uses which method based on their recipes. I’m a spooner, not a scooper, but when I did that, I ended up adding quite a bit more than was called for – but they still turned out. Is it possible I could rise this and bake it as a log of cinnamon banana amazing soon to be bread? Can I substitute the almond milk with another non dairy milk? Maybe soy, coconut, or rice milk? I would love to try this recipe but I’m have a severe almond allergy. Hi Elizabeth! Please check out Dana’s Recipe FAQ page for your substitution questions! What is vegan butter made of? I try not to do oil and/or highly processed foods. Thanks. These look amazing. Check out the ingredients label to see. The problem is that if I make these cinnamon rolls, I’d eat all of them before the brunch even starts! :D my next challenge to you: CHOCOLATE cinnamon rolls. I used whole wheat flour for the entire measurement and made a cream cheese icing. The icing was SO complementary. Who would’ve thought to put banana bread and cinnamon rolls together? Almost a crime it hadn’t been done sooner! Can we freeze the dough and not actually bake the cinnamon rolls until the morning, or do they need to be baked right away? You can freeze the dough. Just let it thaw completely, then preheat the oven while they rest on top of the oven. Bake as instructed! Can i substitute vegan butter for normal butter? My friend got me onto this website because of your awesome vegan cinnamon scrolls. They are to die for! My fiancee LOVES banana treats so I’m going to try these ones out. Can’t wait to taste them. Thank you so much – you are awesome. Can I sub coconut oil for Earth Balance? It will affect the flavor, but I think so, yes. These look amazing!! I can’t wait to try this out, I am always looking for a substitute for Earth Balance or vegan butters… I live in a remote area and you cannot get it! Coconut oil is also always a liquid here never a solid! Any great suggestions out there?? Much love!! I am so happy I found your blog with all the amazing recipes! Just made these babies, for tomorrow’s brunch with my boyfriend’s family. I figured we’d warm them up a bit tomorrow, and I have the frosting in a separate jar until then, this should work fine, right? Of course I also had to taste one already (got enough rolls that two were baked separately from the others), and it is absolutely delicious. Combining banana bread with the rolls is a great idea! These are amazing! They are reasonably easy to make and delicious! Just made them for the second time today, and I will be giving them to my mom for Mother’s Day! I also definitely recommend adding the glaze. Thank you for this wonderful recipe. Thanks for sharing, Kathleen! Hope your Mother’s Day was awesome. Just made these. Didn’t even frost them, and I’ve already eaten more than three rolls. Yum. trying make these bad boys right now. Waiting for my dough to rise. But it is normal that was super duper gooey when I was trying to knead it? No matter how much flour I added it was gooey. Tips? it’s it’s gooey, add more flour! You want it to be soft, but workable and not sticky. These turned out amazing! It was so hard to not stop eating them. I used Namaste All-Purpose GF Flour blend. hi! can you make these overnight so they’re ready to bake in the morning. like christmas morning. haha :) thanks!! Yes! I would recommend making the rolls up until the baking part. then covering with plastic wrap and refrigerating overnight. then, bake as instructed in the morning, setting them on top of the oven while it preheats! Good luck!! Hi Dana, love this idea and thinking about making these for Christmas morning! One question – have you ever made these in advance and then pulled out to bake? Would like to make the day before and pop into the oven! think you could! Just make them up to the baking part the night before, cover and refrigerate, and then bake the next morning as instructed! These are delicious, super fluffy. For those in Australia, I used nuttelex and the end product was a ripper. Thanks! Thanks Tori – you’re a lifesaver. I was having a hard time finding dairy free butter, so I’ll just use the Nuttelex in the fridge! I made these a couple of days ago, exactly as written with the exception of adding two more tablespoons of sugar to the dough. In my oven, they needed to go for almost the full 35 minutes, but they were delicious, with an amazing, fluffy texture. Since my kitchen is cold and drafty, I used a tip I had seen elsewhere for letting the dough rise and wrapped the entire bowl in two bath-sized towels. Then we went to the gym for an hour. :-). By the time we got back, the yeast had done its thing and the dough was ready to roll! I used a vegetable peeler to slice up my bananas, and Daiya cream cheese because I can’t do soy. I haven’t tried Tofutti, but Daiya is a little sweet already, so I only needed two cups of powdered sugar for the cream cheese frosting. These were awesome, and will definitely be part of my special occasion repertoire! Oh Wow! These are brilliant, definitely cooking them up this weekend! Don’t know what I did wrong (maybe it was subbing half garbanzo bean flour?) but these stayed so sticky they were hard to cut. But I don’t care…the smell from my oven is amazing! I’ve made these twice now and man, they are awesome. Quick and easy to make and so good. The second time around, I left out the cinnamon and added chocolate sprinkles to the filling, goes together well with the banana. Just obe question, last timd I made cinnamon rolls with instant yeast it tasted a lot like yeast..
Not sure! If you’re weary of instant, just use regular and give it more time to rise. Good luck! 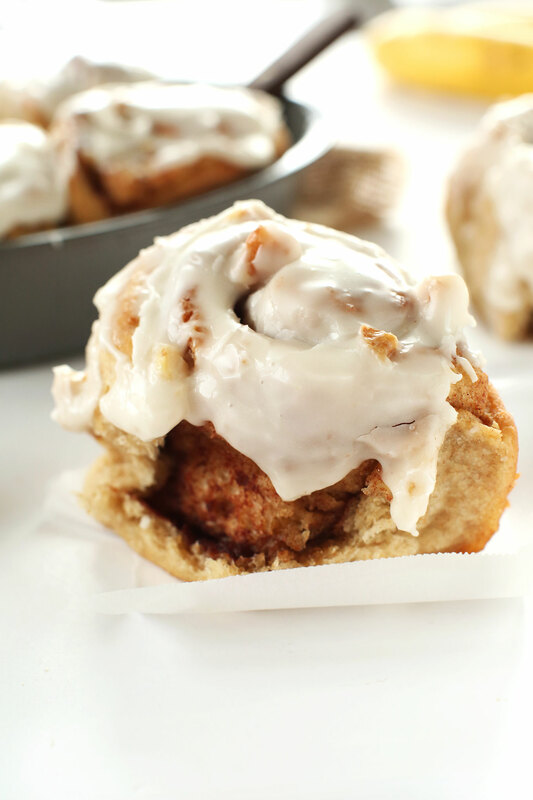 The Cinnamon roll love on this blog is amazing! Made these today and they worked out great! thanks for the recipe!! Lovely! Thanks for sharing, Heather! Finally made these! 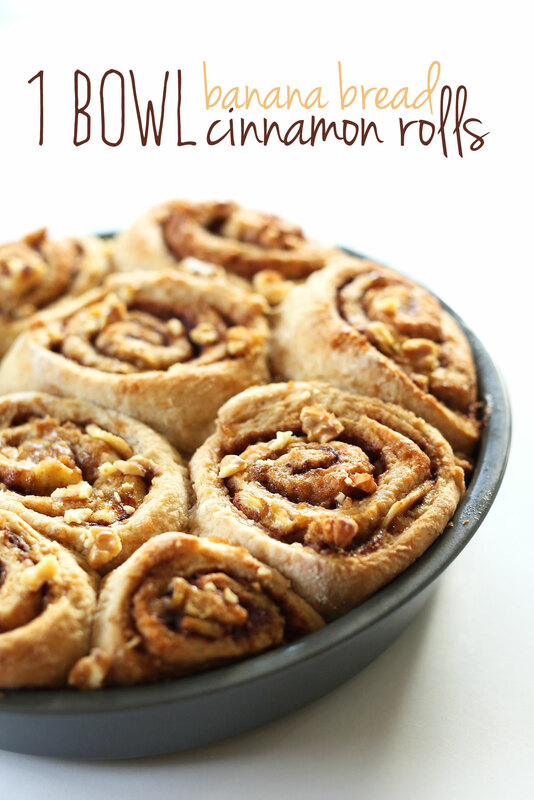 I have tried these and the regular cinnamon recipe…. I love how easy they are to make! My only complaint is they are a bit “yeasty” for my tastes…. do you have any suggestions to combat this at all? Hmmm. Perhaps next time try baking them on a baking sheet lined with parchment spaced apart a little bit so they have a bit more space to “breathe” and crisp up. That should help! Another brilliant recipe Dana! Can’t wait to try this. Omg I can hardly stand how tall and fluffy these rolls look! I’m a banana bread-FIEND so these are right up my alley! Totally loving the double-banana action going on there. :D Pinned! 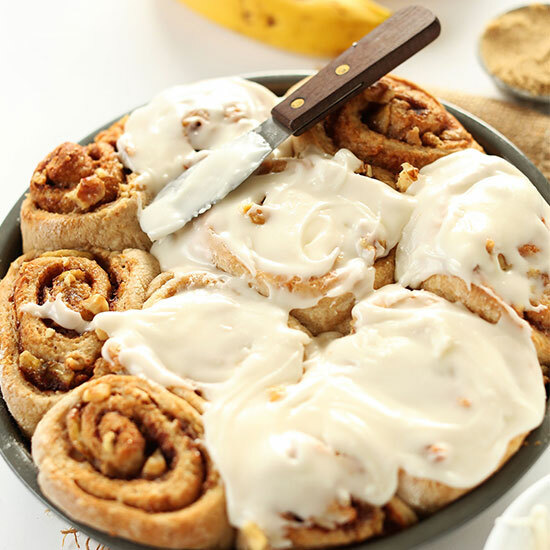 Words cannot describe how badly I am craving one of these banana bread cinnamon rolls right now.. they look super delicious. Especially loving that thick layer of frosting going on as well. Pinned! Oh, wow….I’m definitely going to do this. I already love your cinnamon rolls, so should be a doddle to add the bananas. Won’t be today, but next weekend! Oh my gosh! These have got to happen…and soon! I’ll be sure to instagram if we do them this weekend! Dana, I love you! I haven’t yet tried this but I got sooooo excited when I saw your IG post on these!! I was like this is the best idea ever!!! 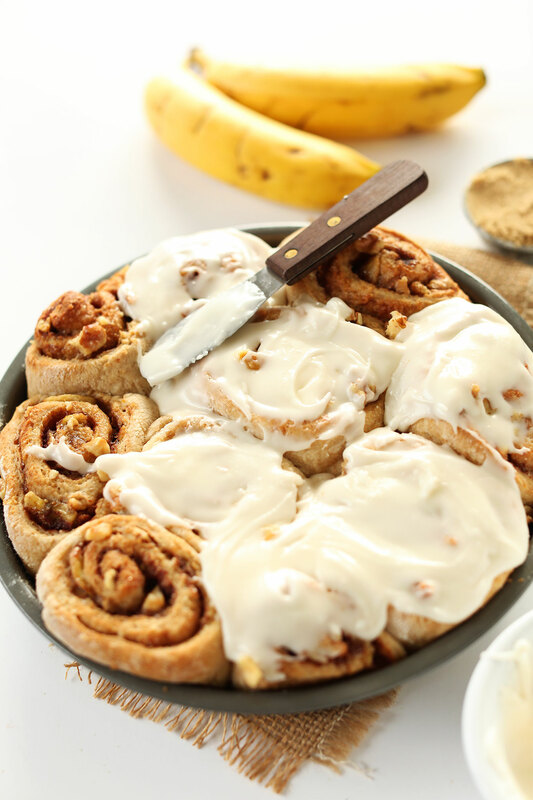 Vegan banana cinnamon rolls!!!! EPIC. You are a baking goddess. Thank you. I have black spotted bananas on my countertop just begging to be made into this! I will report back when I’ve tried it. Thank you you wonderful woman! Thanks Felicity! Let me know how the rolls go! My dear girl, you are just too brilliant for words. Umm…I need these right now!! Looks so tasty!! Dana you are a genius! I can’t wait to try these! What are your thoughts on subbing gluten free flour? I know it’s never really the same as traditional flour but I’m thinking it would also be delicious! Awesome – Looking forward to the recipe! I cannot read your blog without my mouth watering! Another amazing recipe I will need to try! I think you’re a genious. These look amazing! I tried these, but am not a huge fan! :( Maybe it was some changes I made, not sure. I also made the dough the night before and let it rise overnight. Everything came together normally, but the end result was disappointing. First of all, they took forever to cook! It definitely might have been my oven, but they ended up hard on the outside and still soft on the inside. I like super soft cinnamon rolls, so I’m not sure if it was the addition of banana in the dough that made them not cook uniformly? And as I mentioned before, the dough was too flavorless for me. I shouldn’t have decreased the salt and I think I prefer sugar in the dough like normal cinnamon rolls. I think it’s probably a great healthier cinnamon roll recipe and I really hope others have success! I’ll blame it on my oven and my error for decreasing the salt. Maybe I’ll try these again and report back with better success! I was expecting the bananas to be mashed and included in the dough, but including thin slices in the roll itself sounds even better! I do have a question – do you think you could make these ahead of time, refrigerate them overnight, then bake them in the morning? I don’t work with yeast very much and I’m not sure if refrigerating would mess with the dough staying risen. Thanks! do you remember how many bananas do you need for those 2 half cups, mashed & sliced ? thanks in advance ! 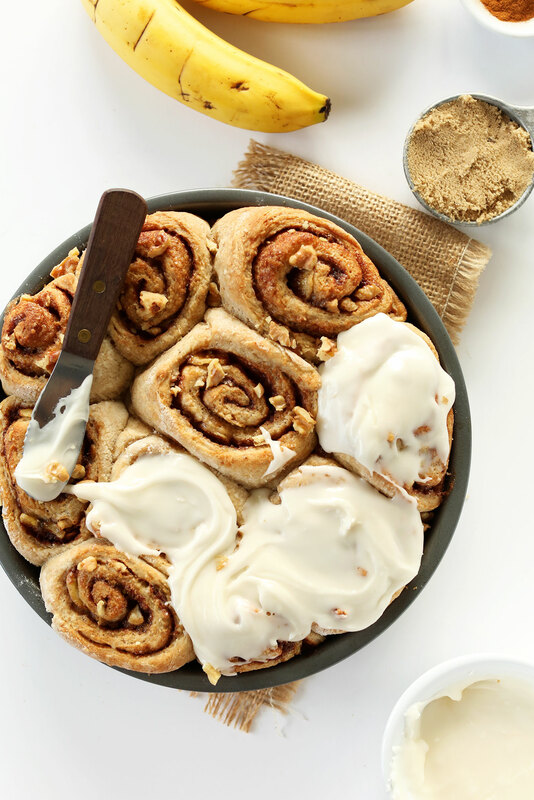 Okay, you guys did it – these cinnamon rolls look OVER THE TOP ahhh-mazing! I cannot wait to try these because Banana Bread is one of my fav. things ever and so are cinnamon rolls! And can I just say, gooey is the best word ever to describe baked goods – ever! Hi Dana, do you think this will work with gluten free flour? I wish I could comment, but I haven’t experimented with a GF cinnamon roll yet. But if you try it, please report back! Um.. can I come over for breakfast? Um, are we internet besties? YES and YES! Holy moly these look SO amazing. I must make these soon! I was disinclined to believe the title, but then I clicked over and oh. My. Gaw. Seriously, you guys are amazing. This looks FANTASTIC–one bowl, indeedy! Sharing and saving, Dana! Thanks, Ala! Hope you enjoy these gems! Can I sub pastry flour for whole wheat white ? I was just looking at the 3 pathetic looking browning bananas on my counter and wondering what to do with them. I was going to go with banana pancakes, but this is much more decadent! As soon as I get home from work tomorrow, I am going to make these! 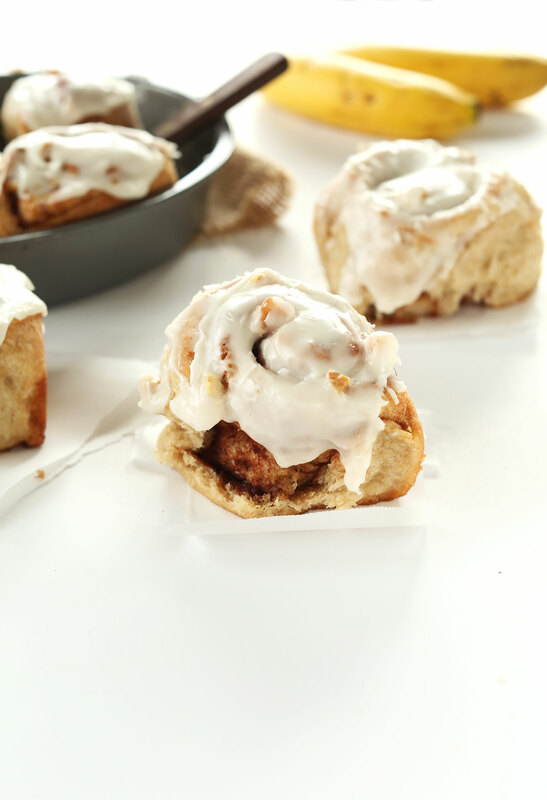 I don’t think I’ve ever come across banana bread cinnamon rolls – what a fantastic idea to combine two wonderful baked goods together this way! I like the idea of using banana as a natural sweetener, too. I imagine these would be quite lovely for breakfast. Oh yes. TOO lovely. I had to hide these from myself. That’s when you know they’re good. If i don’t want wheat flour – what would you suggest as an alternative? Not sure I understand you. Are you OK with using all purpose? Otherwise, I wouldn’t be able to advice on other flours as I haven’t tested them. Why are these not in and around my mouth, right now?! Sorry? Ha, thanks Rachael. Hope you give these a go! Ohhh lordy the way that thick cream cheese glaze is cracking on top in that last picture. Why can’t there be a high five emoji for desktops? These look great. Now…did you ever think of marrying cinnamon rolls with apple strudel? I had a vision of apple slices in place of the banana slices. Or, have you thought of trying to make them gluten free (hint hint)! Ah, great idea! That’s next on my list! Yes, gluten free. Pretty please? Thank you for the suggestion, Natalia! 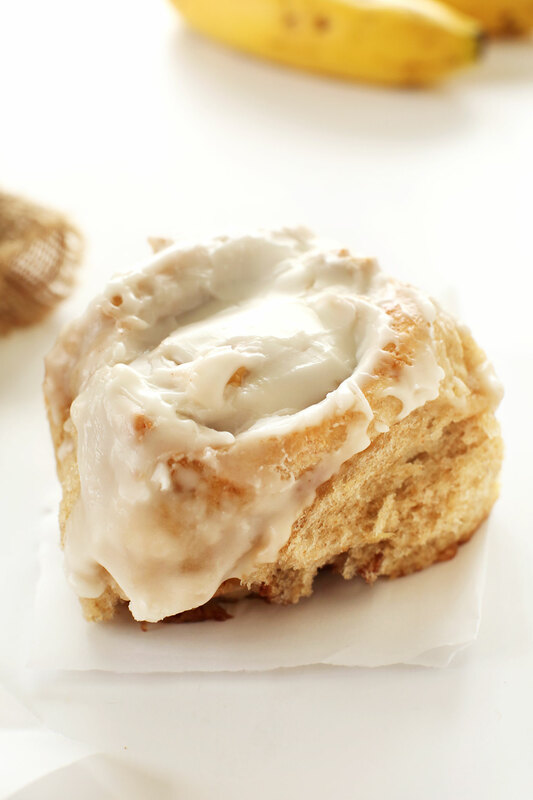 We do have a gluten-free cinnamon roll recipe which you can find here! Hope you enjoy it! Gluten-free version for me too, pleeeeeease! Sounds great!I like banana pastry, but this! This is something different! Bananas in cinnamon buns? Cooool! Just made these…. PERFECT! AMAZING! DELICIOUS! INCREDIBLE! The banana, which is not obvious or overpowering, gives this that certain * magical * touch! On my list for more, already shared with my mother who loves the Cinnabon version at the mall – no longer! This is so easy to make, a bit of waiting time for the dough, 30 minutes in the oven, done! Thank you so much for this idea!!! Holy cow these look amazing! Definitely going to have to give this one a try. Oh my…these look downright divine! I know it’s still a way off, but these look like they might be perfect for my family’s Christmas breakfast :) Yummm. As much as you want! I’d say 1/4 cup, which is enough to sparsely cover the surface. Hope that helps! These look sooo good! Can`t wait to make them! Might I ask who is Rhonda? This looks great Dana Family Approved!!!! This looks like my new favorite dessert! Bananas AND frosting?! I am counting the minutes until I can whip this up for myself! Brilliant! I’ve never had anything like banana bread cinnamon rolls before. These look absolutely amazing! Banana bread is one of my favvvvvorite things ever. I have a bazillion recipes for it but have never done banana cinn rolls. You’re a genius! AND they’re vegan AND they’re one bowl! And almost no kneading! Amazing! Pinned! Thanks, Averie! I think you would LOVE these. Thanks for the share! I think you just discovered my new favorite comfort food. Love this!